We will pick you up from your hotel or guest house in town with our licensed English speaking tour guide. The guide will give you a small English handbook that will teach you about the elephant’s life style and what to expect from the mahout lessons you will receive on this tour. This hand book will be used for instruction until the end of the tour. Arrive at our elephant camp, change clothes, meet our family and start the basic training course on how to speak and command elephants. Learn and practice basic commands in Karen (Hill Tribe) language. Ride the elephant(s) bare back like a real mahout around our farm / elephant camp area. Eat Lunch like a mahout – coooked by our “Mama” Aumara Panyamoon, this authentic Northern Thaifood is great and will most likely be a highlight of your trip. Start to try and control the elephants. Ride the elephant bare back to the river and give your elephant a bath. Every elephant loves to play in the water, so you will get wet for sure. Finish the day with a relaxing Bamboo rafting trip down the Maewang river for about 40 minutes. Check in to Plern Home resort and check out your hand crafted, yet air conditioned room which features a private hot shower and American style toilet. Casually take your elephant for a morning bath and prepare all the gear for your elephant(s) to be ready to work. We know this is fairly early, but you probably will get up early in our village as there are lots of Roosters! Have breakfast at the resort. 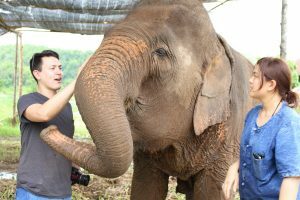 Review the elephant training lessons and work with the elephants more like a professional Mahout. Round trip transportation, elephant handbook, activities as listed above plus food and lodging, experienced & licensed guide, drinking water, clothes to wear when working with the elephants, elephant food bag and medical insurance. Your clothes to change, Towel, sport shoes, sandals, socks, swimming suite(for fullday and 2days programs only), sun glasses, sun-block cream, small day-bag, anti-insect spray, camera and personal medicine (if any).